Snail on reishi (II), Kokusai — Sydney L. Moss Ltd.
Tokyo, mid to late 19th century, circa 1860s - 1880s. Sydney L. Moss Ltd., “Eccentrics in Netsuke”, 1982, no. 80. Moss Ltd., “Kokusai The Genius”, 2016, no. 87. 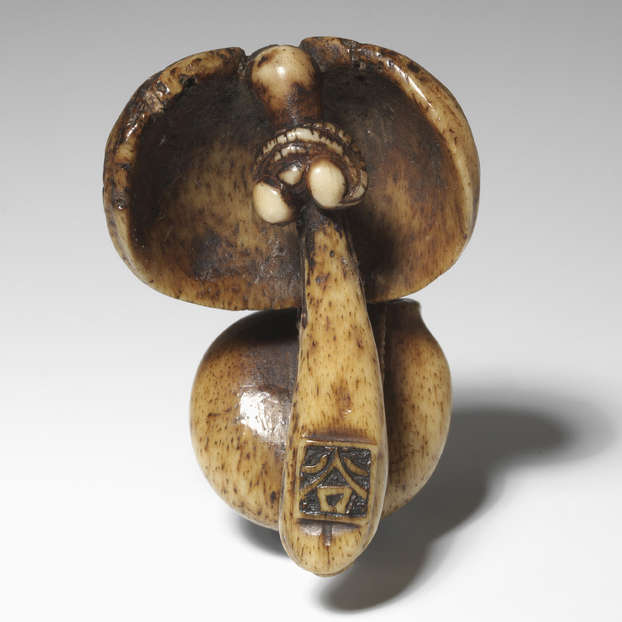 A stag-antler netsuke of a snail crawling, body and shell less markedly angled, onto the head of a reishi fungus on its stem, its two antenna-end “eyes” inlaid in dark buffalo horn or jet.